Evolve Into The Next Level. Playmakers Academy focuses on student - athletes who are looking to improve their athletic performance and fitness through the most cutting edge structured proven physical regimen. Our program is a prepared plan specified to improve an athlete's' strength, speed, power, agility, quickness and discipline. We incorporate an effective weight lifting program together with athletic movements to transform you into your best possible. During the program we emphasize safety and proper technique above all else. Our goal is to help bring the "playmaker within" out of you. We explain what it takes to be successful by enhancing your athletic performance. Our program is driven by a 'Hard Work' attitude. Along with training we offer nutritional, supplemental and mobility information to help you be more of an all around athlete. Training sessions are between 60-90 minutes. 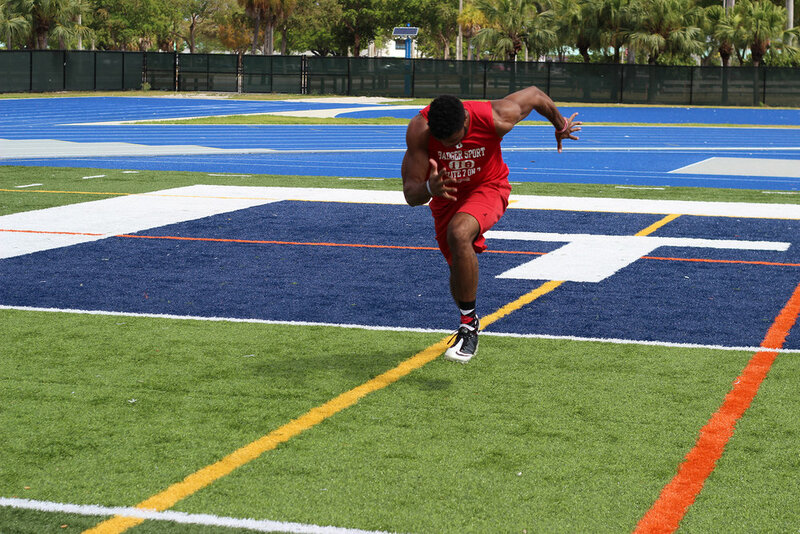 We offer programs for NFL, CFL, GFL Combine & Pro Day Preparation, Offseason Training and College Prep. Key focuses of each session are explosiveness, speed, strength, agility and fast twitch muscles, while working on the fundamentals and proper technique. Every session you will perform exercises to improve your speed, agility, quickness, strength, endurance, power, stamina and explosiveness with a high intensity to give you the best possible results, without reaching a plateau so that you can see consistent results. Speed is the body's ability to go from point A to point B in the shortest time. Speed is critical component of a sport. Athletes must react to accelerate to maximum speed, change directions, decelerate, accelerate and maintain maximum speed. More sports consist of short explosive bursts lasting on average 5-10 seconds. Starts (reaction): The ability to respond to certain stimulus and to get the body moving on the run. Acceleration: The ability to reach maximum speed as fast as possible. 40% of maximum velocity is achieved in 5 yards, 75% is achieved in 1st 10 yards and 90% within 25-30 yards. Maximum Speed: Maximum speed is achieved in 40-60 yards. Speed Endurance: The ability to maintain true speed over a period of time, from beginning to end. Strength: Improvement in strength will help improve force capability. Arm drill, knee drive and starts will all be improved. Flexibility: Increases in flexibility will help to improve the stride length and help to prevent injuries. Power : Increases in power will help develop the start and the acceleration. Conditioning: Increases in anaerobic conditioning will help the speed endurance phase. Agility can be defined as the body’s ability to change directions while maintaining good control without decreasing speed. Reaction time, awareness in space, balance, and coordination are all involved in agility training. All movement patterns such as forward running, backward running, lateral running and other movement drills as skipping, hopping, jumping, etc. are involved in agility training. Most sports are not a straight-line game. They are games of angles, acceleration, changing gears and reaction. Be sure to perform all movement drills in a good reactive athletic position. Strength is the basis for all components of physical training. Stronger athletes have an advantage as it pertains to competition, everything else being equal. Strength fits into the equation for power, speed development, agility, quickness, condition and flexibility. Strength training can also help each athlete's confidence, help minimize injuries, decrease rehabilitation time and give meaning to the entire program. Intensity: In order to achieve goals an athlete must have training passion rather than just getting through the workout. Consistency: Remaining consistent throughout a training program, before, during, and after workouts. Preparing the body to train with good eating habits, proper rest and recovery as well as training with a high level of intensity day in and day out. Accountability: Being accountable to show up each day with a high level of intensity and mental readiness. Also being accountable to yourself for lack of intensity and poor eating and recover habits. Mental Toughness: Training hard each and every day is not easy, neither is being a Playmaker. In order to reach goals you must be mentally ready to complete each workout and mentally strong enough to push through.